For months, we’d been staying in Kotor and along Montenegro’s coast. In both places, our apartments were cradled by imposing mountain ranges. Sometimes, these rugged boundaries had made us feel claustrophobic — like they were hemming us in. However, now that we had penetrated this intimidating mountain range, we were rewarded with entirely new scenes. 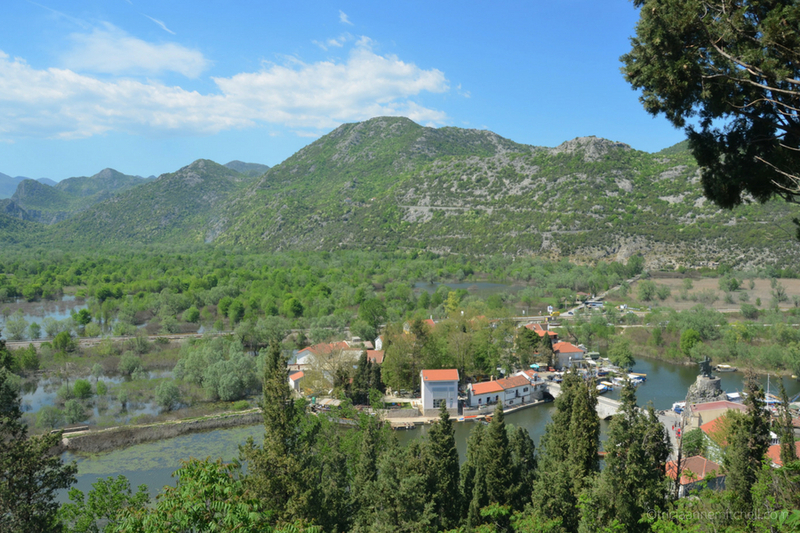 The Skadar landscape was characterized by less grey stone, and more emerald hues. 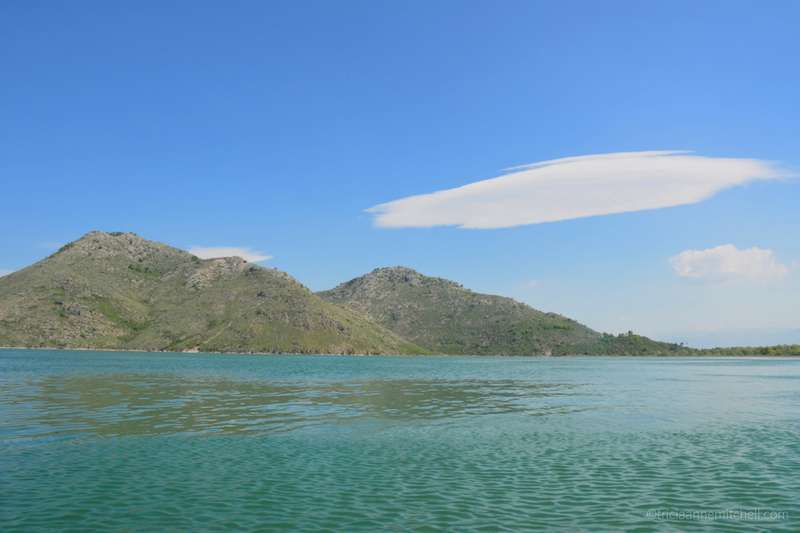 Lake Skadar is shared by both Montenegro and Albania. Montenegro’s portion has been a national park since the 1980s. 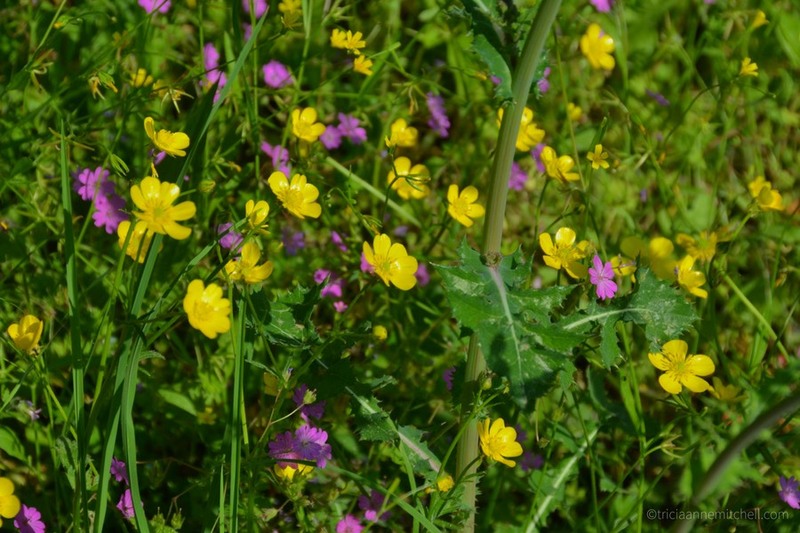 It’s an important nature reserve with an incredible amount of biodiversity. More than 250 bird species live there, and there’s also a sizable fish and snail population. Unfortunately, the area is currently threatened, due to the construction of a tourist resort. 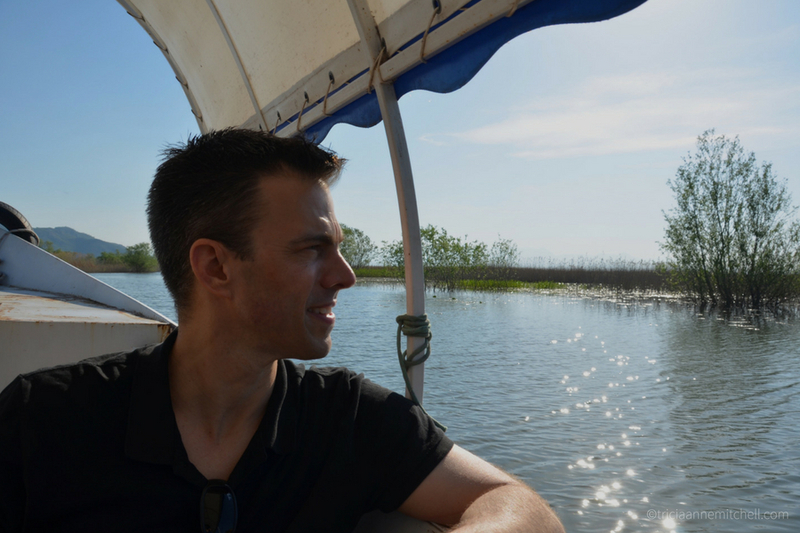 We’d only spend one day at Lake Skadar, but it was just the sort of relaxing day we were seeking. Using the village of Virpazar as our base, we spied flirtatious birds and frogs, skittish green lizards, and a poisonous viper snake (poskok). A choir of male frogs overpowered our lunchtime conversation. Fortunately the viper gave us a wide berth during our picnic. For a few hours we went on a boat cruise with a Montenegrin family. As we glided on the water, we chatted with our guides, Jelena and Andrija, as well as a pair of videographers from Paris. As we scanned the waterscape for birds, Jelena handed out shots of rakija, a type of brandy that’s ubiquitous in the Balkans. Having spent a fair amount of time in this rakija-filled region, I’ve concluded that this firewater is too potent for me. For a first-timer to Montenegro, though, it’s a must-try! We arrived on the island of Vranjina. After climbing a hill to a monastery named after St. Nicholas, we conversed with a talkative beekeeper and the island’s resident monk. The views from the monastery were extraordinary, as was the aroma of wild thyme dancing on the breeze. With such pristine surroundings, we were certain that the monastery’s honey must be equally delightful, however, we couldn’t add any more cargo to the already bursting bags awaiting us back at our apartment. Back on the mainland, Shawn and I perused the stands of Virpazar’s tiny, but pleasant, Friday market. We procured some cheese (sir) for our picnic. The slightly-tangy cheese was a great accompaniment to the bread, peppers, hard-boiled eggs, and nuts we had packed. Jelena told us that a great place to get coffee was Silistria, a restaurant housed in a boat near Virpazar’s town square. Sipping coffee on Silistria’s open deck for an hour, we watched as a bird gracefully dove in and out of the water, herself inspired to catch a bite to eat. Afterwards, we made a short uphill walk to the Besac Fortress, a white stone fort built by the Ottoman Turks in the 15th century. 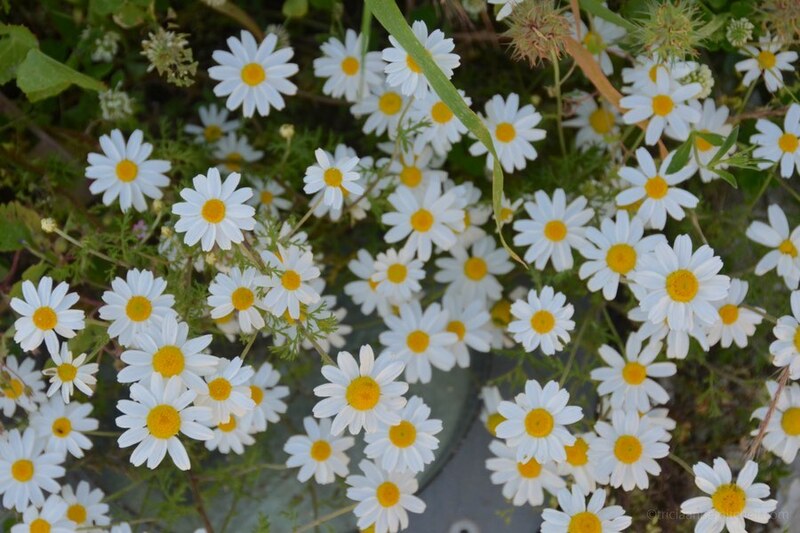 Peaceful white daisies filled the grounds, a stark contrast to the battles that were fought there in centuries past. 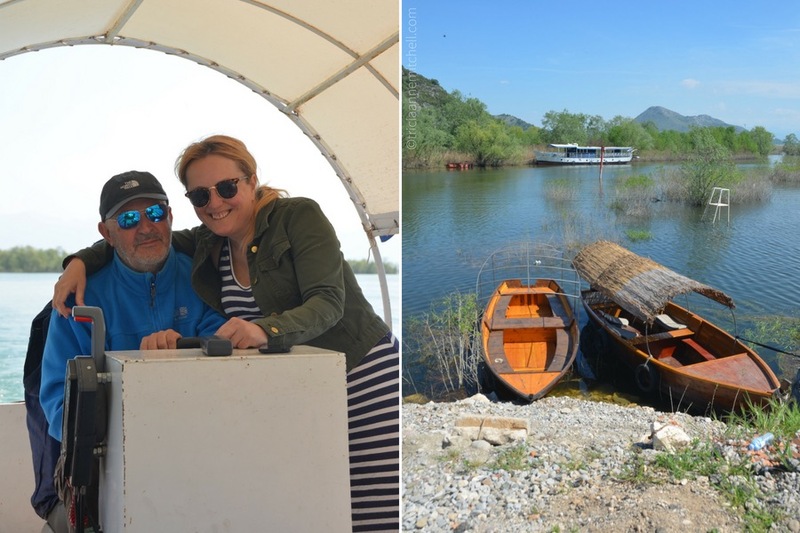 Our Lake Skadar day trip was bookended by tunnel travel to and from the coast. During the train trip back to our seaside apartment, I nearly fell asleep in that seemingly-endless tunnel. l was no doubt lulled by the rocking of the train, and relaxed by the calming scenes we’d soaked up earlier. Taking to the water, we spotted the 15th-century Besac Fortress (upper right). The area’s water lilies hadn’t yet bloomed during our April visit. However, our guide Jelena pointed out the waterway where they’d soon be visible. Lake Skadar was still rather in April. In contrast, Croatia’s Plitvice Lakes National Park was swarmed with visitors when we visited in May. Shawn, enjoying the calming panorama. Vranjina’s springtime flora (left) and winding dirt roads (right). 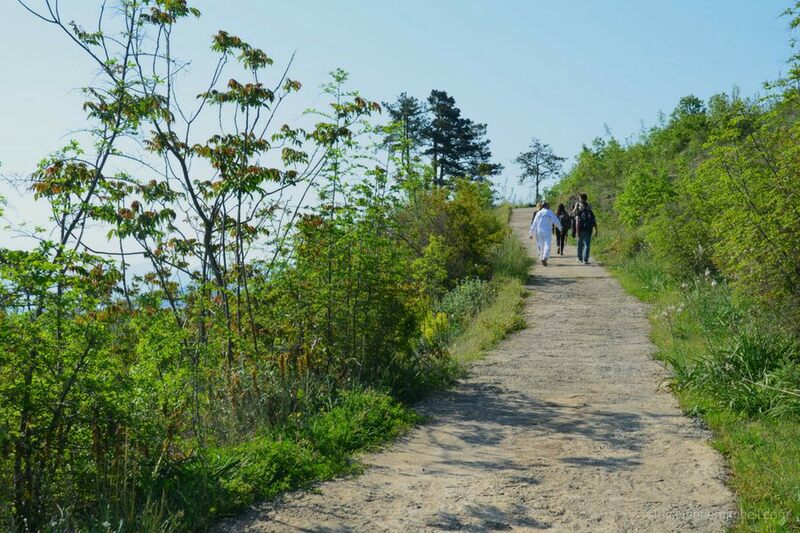 The uphill walk to Vranjina’s St. Nicholas Monastery. 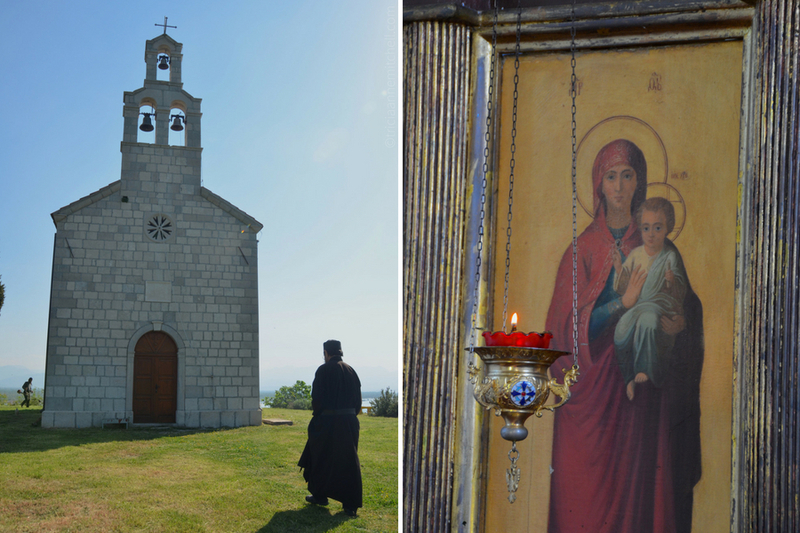 The resident monk leads us to the St. Nicholas Monastery (left), a Serbian Orthodox monastery that was rebuilt in the 19th century. Its interior (right) is decorated with golden icons, hanging lanterns, and fresh flowers. 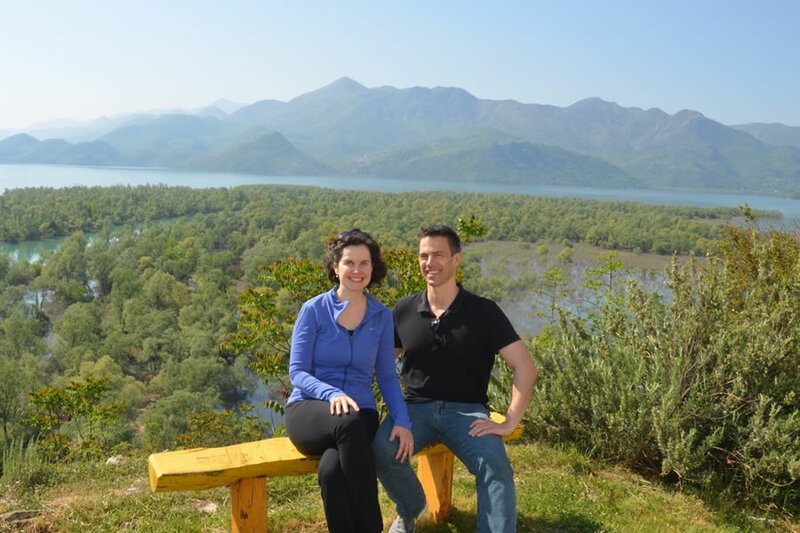 Pausing to admire the splendor of Lake Skadar from the St. Nicholas Monastery on the island of Vranjina. A friendly and chatty beekeeper holds aromatic wild thyme, as bees buzz around him. We wanted to buy a jar of the monastery’s honey, but the containers were too large. 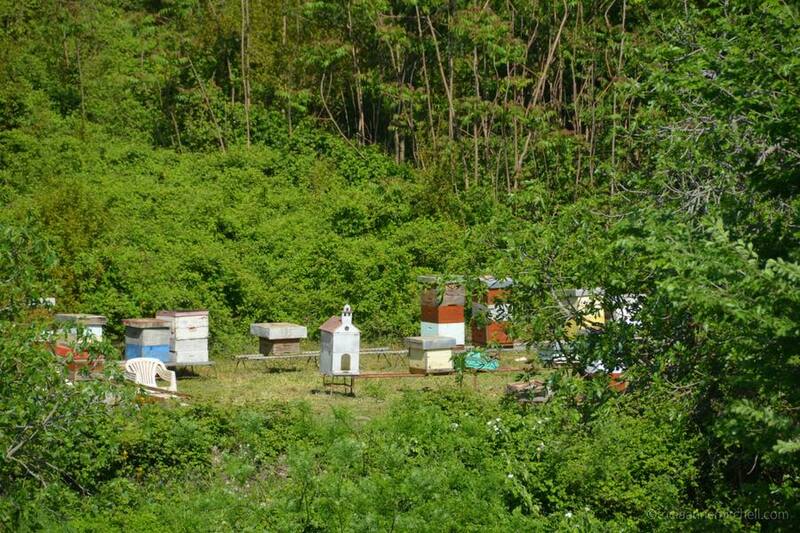 Bee boxes on the island — the one in the center resembles an Orthodox church in miniature. 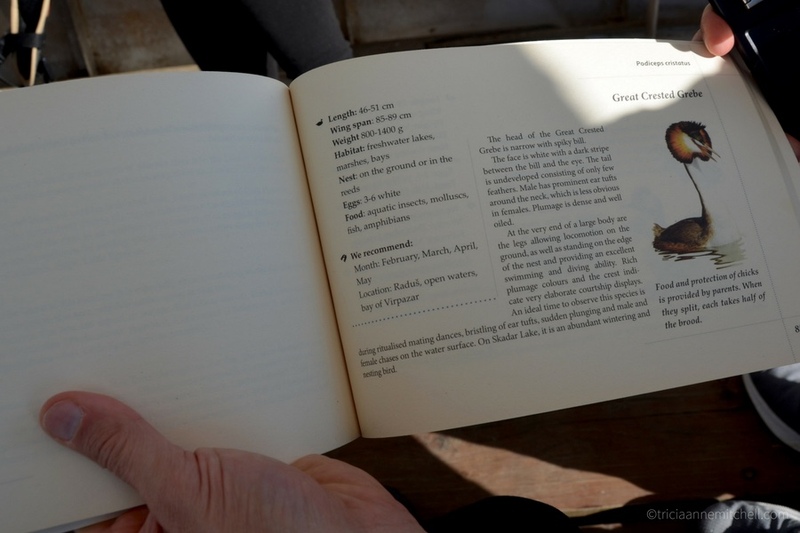 Back on the boat, we referenced Jelena’s birdwatching guide to learn more about the photogenic great crested grebe. Two amorous great crested grebe mirror one another (left) and a silhouetted bird (right). Boat Milica‘s cheerful owners Andrija and Jelena Dabanović (left). 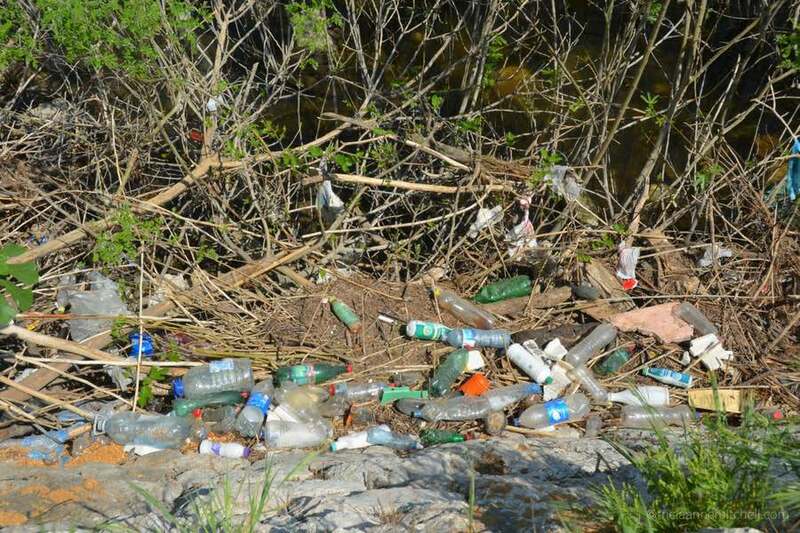 Unfortunately, Lake Skadar is not immune to plastic pollution. Jelena says that she and other residents sometimes organize clean-ups. 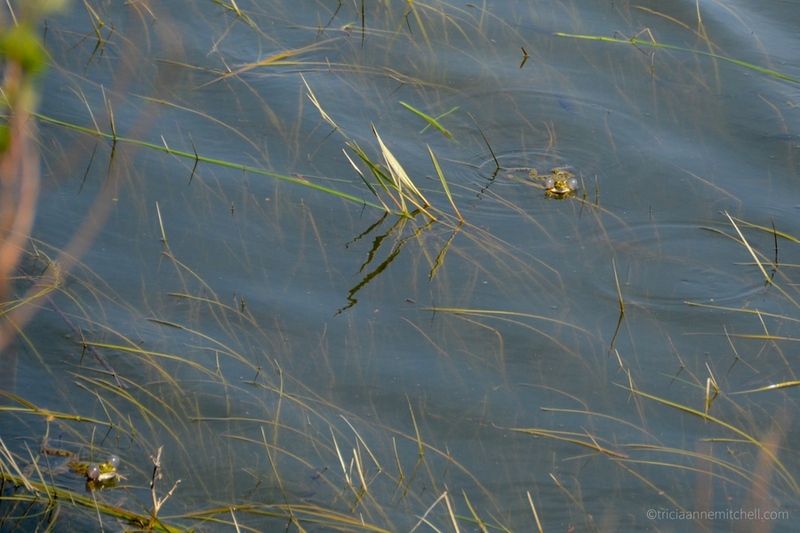 Back on land in Virpazar, our conversation was drowned out by a cacophany of frogs. Here, a pair of male frogs, sporting balloon-like sacks, call out to potential mating partners. 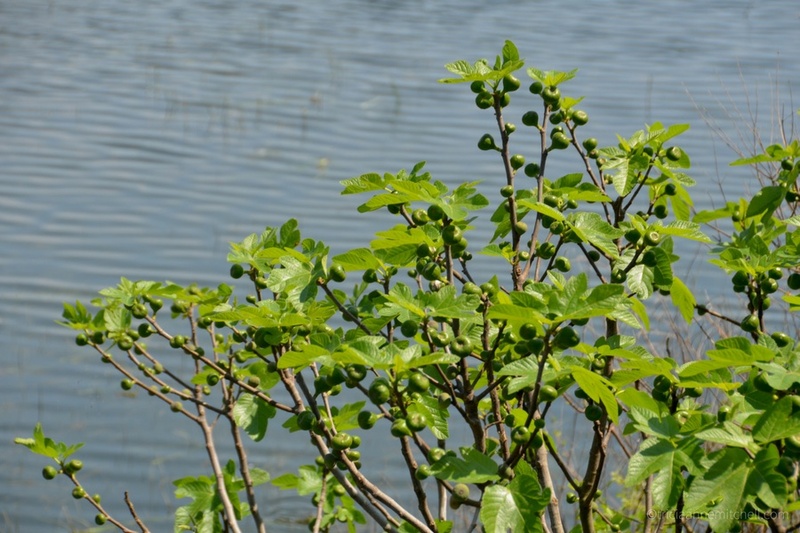 A fig tree. Alas, it was too early in the year to harvest its fruit! A man serenades passersby in Virapazar’s center. Friday is market day in Virpazar. 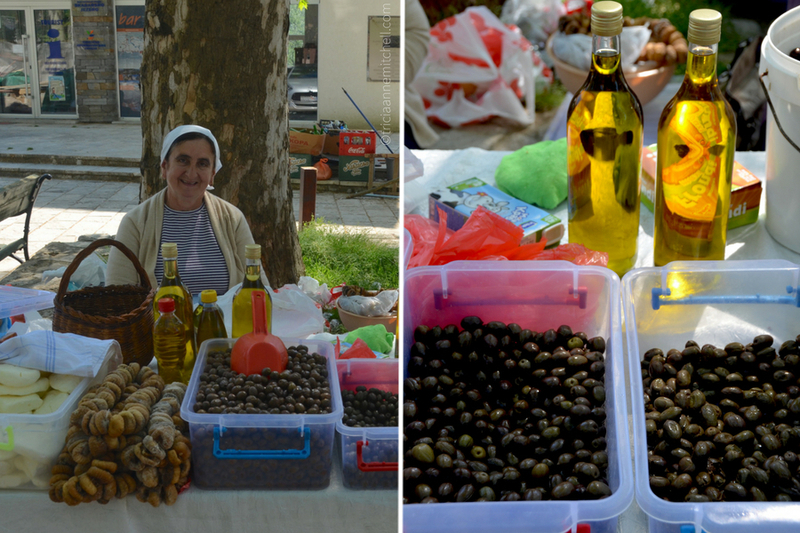 We met smiley vendors, and spotted homemade cheese, dried figs, buckets of olives, and golden bottles of olive oil. The vendors were happy to let us sample their artisanal cheese. We purchased a round made from cow’s milk. Later, we enjoyed it with our other picnic fare. 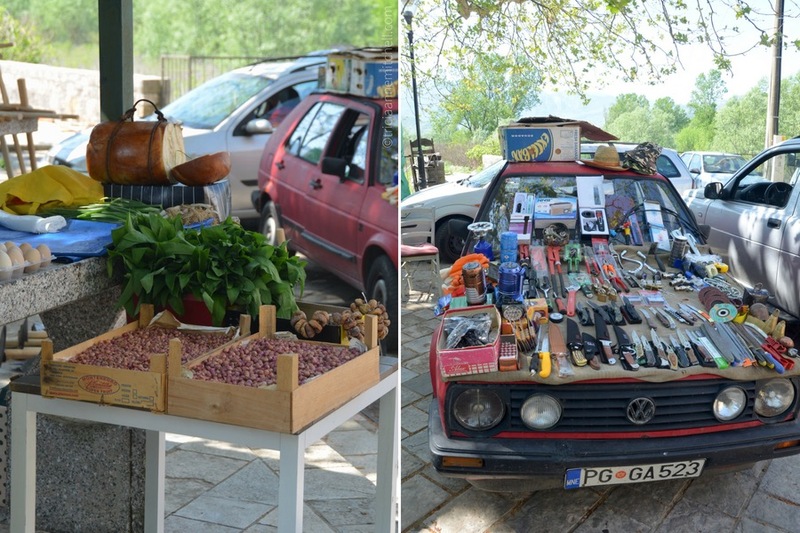 Eggs, wild garlic, dried figs, and tiny onions (left); a car hood is transformed into a mini hardware shop (right). Locals recommended that we try the Silistria boat and restaurant for a coffee break. Filling up our reusable water bottle in Virpazar’s town square (left), and enjoying coffee at Silistria (right). The ascent from Virpazar to the Besac Fortress is not demanding, and the views from the fortress are fantastic. Wild daisies dot the grounds of the Besac Fortress. A bird’s eye view of Virpazar. To the right is a World War II-era mounument, which honors local men who helped liberate Virpazar from its Italian occupiers. 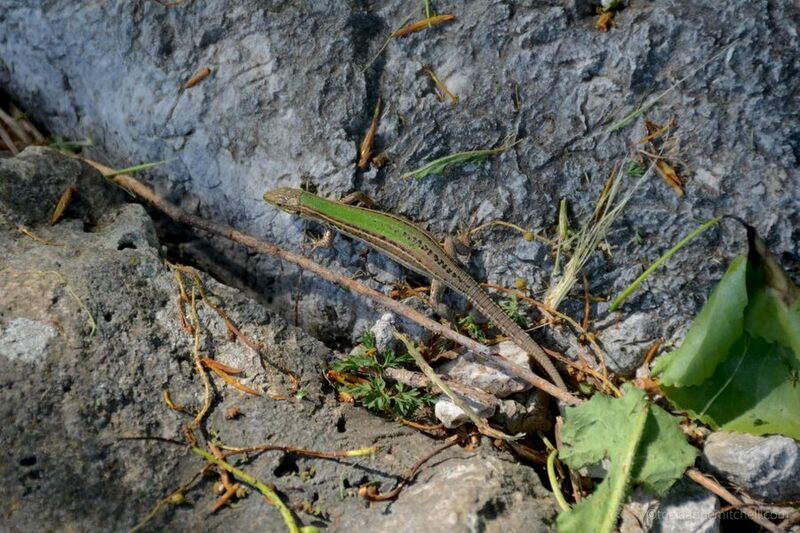 Walking from Virpazar to the train station, we encountered this green lizard. Shawn walks along an old stone road, perhaps constructed during the Austro-Hungarian Empire. The journey from Lake Skadar to Montenegro’s coast takes you through a mountain railway tunnel. Here, a conductor walks along the tracks near Sutomore. 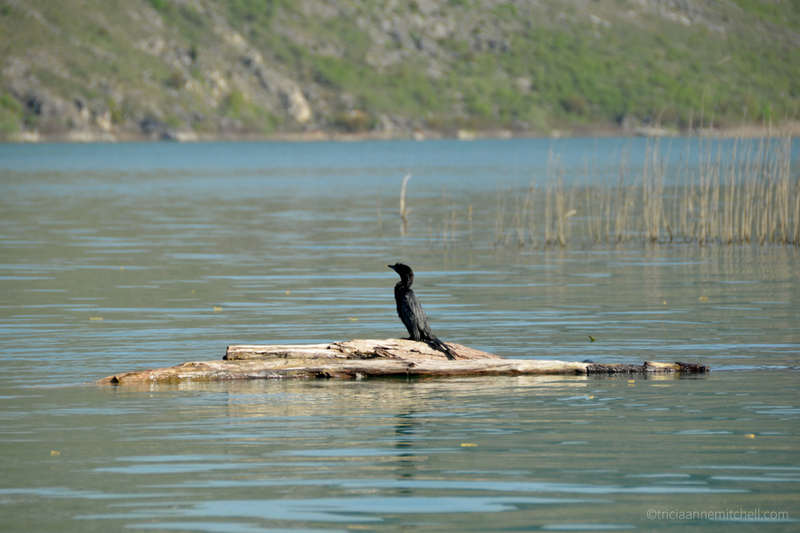 The village of Virpazar is one of the main launching points for exploring Lake Skadar. It is about 30 km (19 miles) from Podgorica, and 25 km (16 miles) from the city of Bar. We made a day trip to Virpazar. 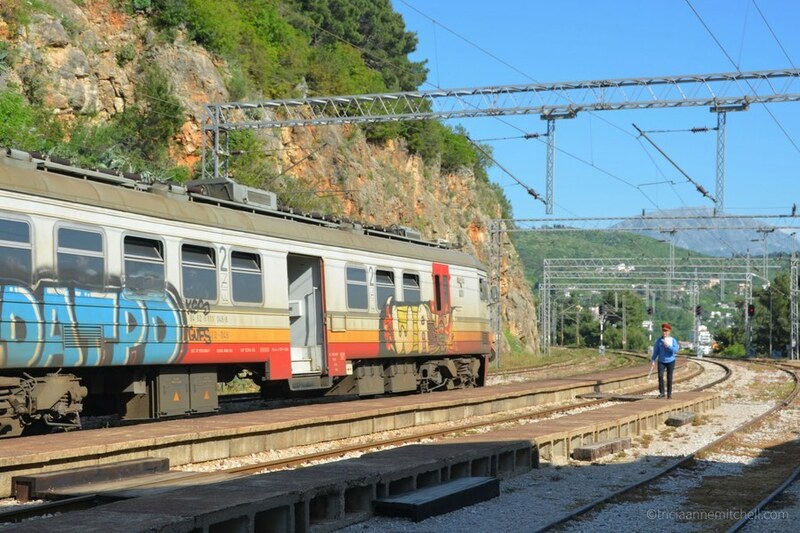 Montenegro’s train service links both Bar and Podgorica with Virpazar. We actually traveled from the city of Sutomore. Here is Montenegro’s train schedule, which includes costs. Our train fare was €1.20 per person, each way. 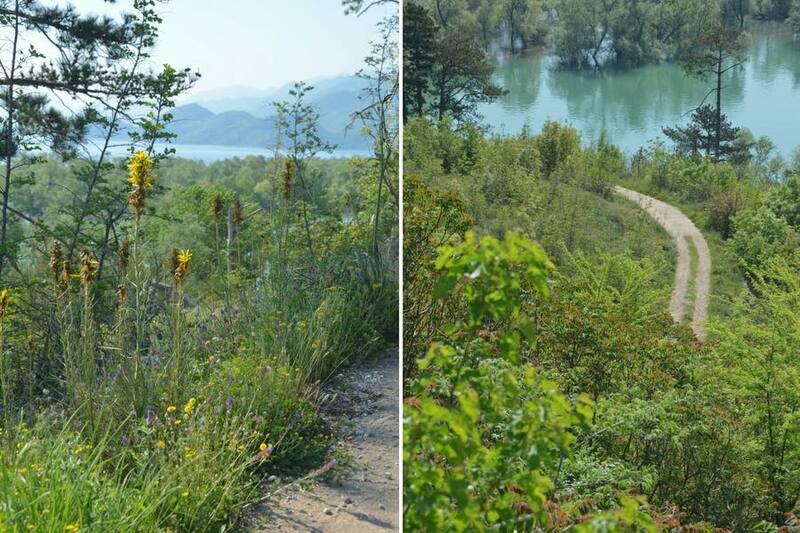 Tickets to enter Lake Skadar National Park are €4 per adult. 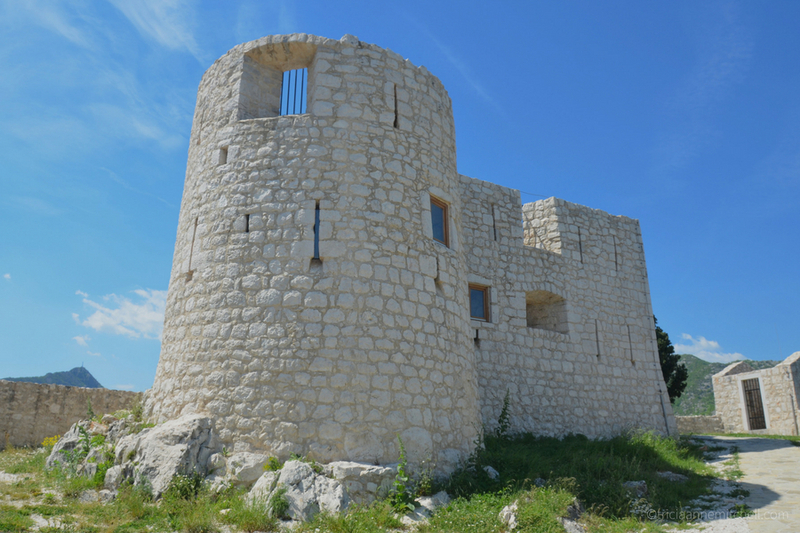 The Besac Fortress entrance is €1 per person. Sunlight reflecting on the lake can be intense — even during springtime. You’ll be happy that you brought sunglasses, sunscreen, and a hat! One day was not enough time to fully explore this special national park. With the Pavlova Strana horseshoe-bend lookout, island monasteries, family wineries, and more villages left to explore, I hope we’ll soon be back to Lake Skadar. See my Montenegro guide for more ideas and travel tips. Photography & text © Tricia A. Mitchell. All Rights Reserved. My husband, Shawn, created the video and 360° photos. Great to see you are both enjoying your time in Montenegro. Wonderful pictures and videos. Darlene, good to hear from you! Yes, Montenegro during the off-season was lovely, despite there being a lot of rainy days in the mountains. Still, we were able to squeeze in a good number of hiking days. 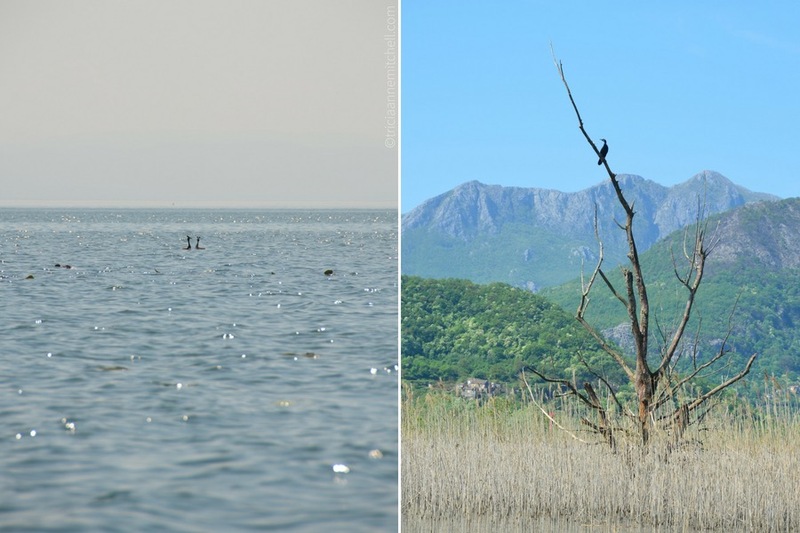 Lake Skadar is definitely worth a return. Tricia, great to see your newest adventures. It looks like such a wonderful place you both are in. I loved all images and explanations, as usual you are terrific in all of it. Cornelia, Servus :) We did have a wonderful time in Montenegro earlier this year. Since we were there during the off-season (Feb – May), the towns were quieter and this made our day-trips quite pleasant. Outdoor experiences such as this one (plus hiking) were our favorites. Servus, Tricia. It must be so wonderful to enjoy the off season with hiking and other wonderful activities, Montenegro seems to be a most beautiful place. Thank you for responding dear Tricia. For being a small country, Montenegro does have diverse offerings. Now that we’ve explored the coastal part of the country, as well as a bit of its inland, I’d love to explore its rugged north. The national parks sound wonderful. I always enjoy a boat tour. It’s such a nice way to see a place from a different perspective. Carol, when we return to Lake Skadar someday, I’d like to rent a car and stop into some of the villages and see some of the look-out points. I’ve heard that many of the roads are narrow and curvy, though, so it sounds like boat exploration is easier on the nerves. :) Speaking of boat journeys, are the any favorites you would recommend? We’ve just been in Canada for five weeks and of course the highlight was the boat ride up to Niagara Falls – spectacular! One of my favourites from previous holidays would have to be the cruise on Lake Windemere in the Lake District of England. It was absolutely beautiful. I haven’t been to Niagara Falls since I was a child, but Shawn hails from Canada. Here’s hoping that you had a wonderful month plus there, Carol! We had five amazing weeks, Tricia. Virginia, glad to have you along! :) I hope that you’ve been having a wonderful autumn. We’ve left Montenegro, and we’re back in Germany now. 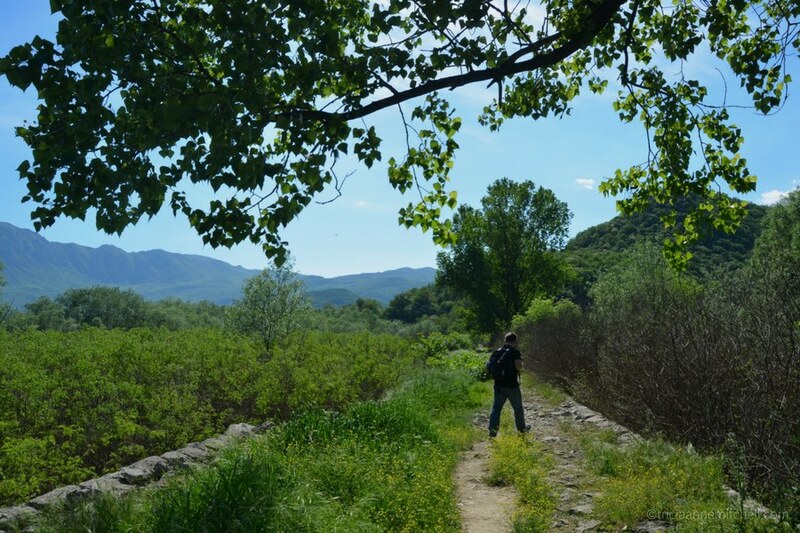 The weather has been splendid — perfect for getting out in nature as we did here at Lake Skadar.